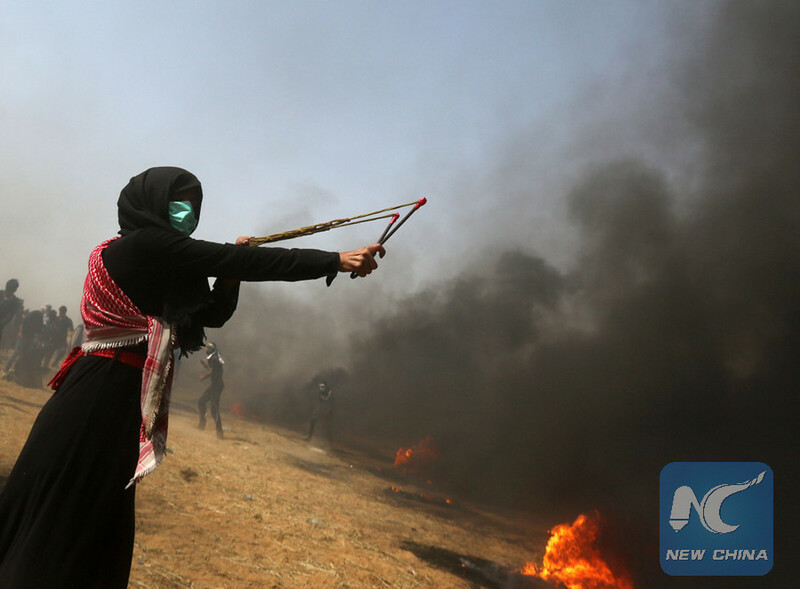 GAZA, April 13 (Xinhua) -- In a rare scene, Palestinian women were on front lines during Friday confrontations with Israeli soldiers along the Gaza-Israel borders. 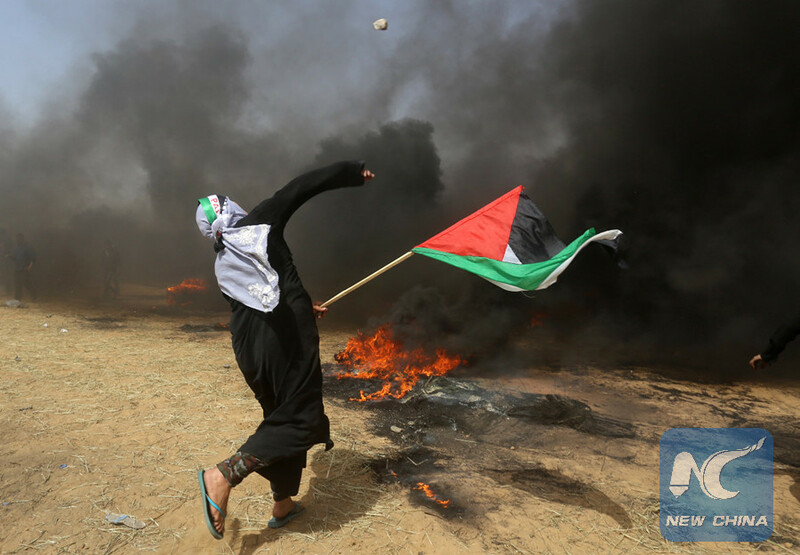 The heavy shooting of bullets and tear gas by Israeli army did not prevent women demonstrators from joining the weekly rallies in border areas. Thousands of Palestinians gathered at the eastern area of the Gaza Strip to carry on their protests in the third consecutive Friday mass rally against Israelis. 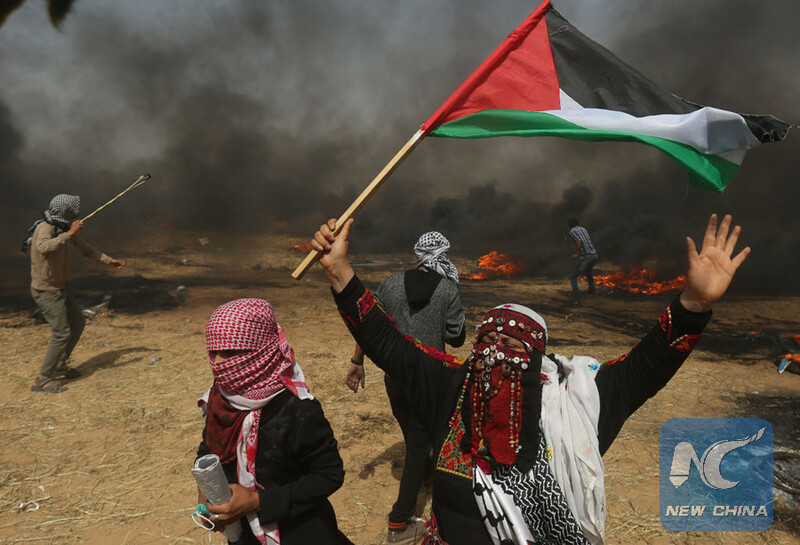 As part of the six-week rallies called "the Great March of Return," which started on March 30, Palestinians held five rallies in eastern Gaza Strip along with the border with Israel to demonstrate. The marches are expected to peak on May 15, the day after the 70th anniversary of Israel's declaration of independence but marked by the Palestinians as the Nakba Day, or "Day of the Catastrophe." On the third Friday of the mass return marches, women threw stones at Israeli soldiers while others raised the Palestinian flag along the fence. Other women managed to carry rubber tires and transport them to demonstrators who burned them to obstruct the vision of Israeli soldiers to avoid more casualties among protestors. "My presence at the rally is to help men in national struggle," Salsabil, a 23-year-old young woman, told Xinhua during a protest in Gaza city. Salsabil, who is originally a refugee from Jaffa city in Israel, said peaceful demonstrations require the participation of all segments of society. "Joining such protests brings us closer to returning to our homes that we were forced to leave," she said, holding stones in her hand. The young lady said she knows it is dangerous for her to be present at such a place, but she stressed that it is important for all women to champion their national causes. Near Salsabil, Sarah, a 20-year-old girl, carried car tires to demonstrators and helped young men pull up barbed wire placed by the Israeli army before the border fence. "The Palestinian women are an integral part of the society ... today they are to prove this," Sarah said after she gave a car tire to a masked protestor. "The national struggle and defending the refugees' right to return are not limited to men. Palestinian women are always at the forefront," she said proudly. During this Friday rally, one Palestinian was killed and at least 968 others were injured in clashes between demonstrators and Israeli soldiers in eastern Gaza Strip. Health ministry in Gaza said a 28-year-old Palestinian died of bullet wounds he sustained earlier in the day. Among the injured, 223 with were shot with live ammunition, of whom 15 are in serious conditions. A total of 17 paramedics and local journalists and cameramen were also injured during the demonstrations. Meanwhile, the Israeli army said it troops responded with riot dispersal means in dealing with protestors in Gaza. The army added that Israel will not allow any harm to security infrastructure that protects Israeli civilians, and will act against violent rioters who threaten to damage it. "It is really serious and dangerous, but this will not stop Palestinian women from participating in the freedom struggle," Sarah said before she rushed to help evacuate an injured protestor.